Admin's Note: This is an archive article that has been moved over from our old site. Author and photographer credits are unknown. Originally published in 2001. 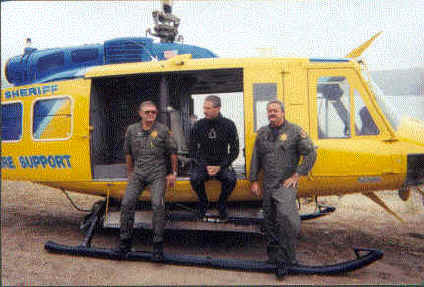 The Dive Team gathers for a briefing on helicopter operations at Lake Piru. Pilot Jim Dalton, Crew Chief Ron Stufflebeam and Senior Deputy Frank Underlin lead the training session. 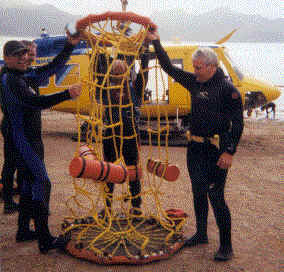 Tim Coates, Andy Martinez and John Jackson hold up the Billy Pugh used to recover divers and transport them over short distances to shore. Using this device is less time consuming than a mechanical hoist. 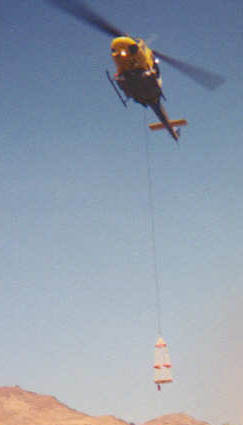 The team also trains using the hoist when it is available. After the briefing, team members line up for a dry run. It is helpful to get the feel for what to hang on to and where to step when entering and egressing the helo while it is still on the ground. This exercise prepares divers to execute the skills smoothly when the helo is airborne and hovering over the water. 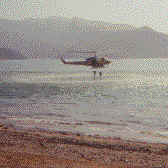 Divers are allowed time to familiarize themselves with the aircraft. Andy Martinez gives a "thumbs-up," signaling that he is ready to go. Teammates John Jackson and James Dobar discuss their plan before boarding. The area is cleared for take-off. 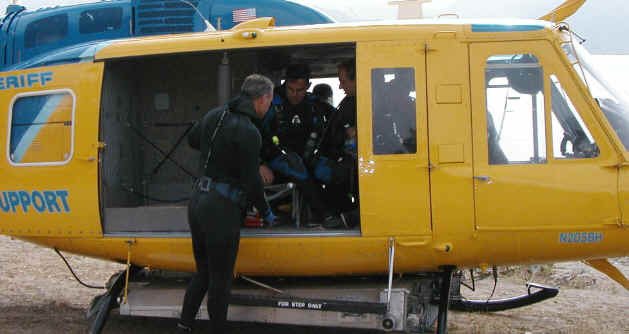 A crew chief inside the helo signals divers to egress the craft. It is important for both the divers to go at the same time so the helicopter doesn't experience a dramatic weight shift. On this training jump, the divers timing was off. Diver's view of the Billy Pugh as is comes into position for a pick-up. Jim Traverson enjoys a ride back to land after a successful jump. Up to four divers can be quickly and easily transported using this method.